Yes it's supposed to be supported at all PayWave terminals. Interestingly however, Xing Wang HK cafe (which has a PayWave terminal) specifically said that they do not accept Samsung Pay. If I understood the cashier correctly, they have not implemented something at the back end which prevents them from processing payments even though the transaction would go through at the PayWave terminal in the cafe. The cashier sounded as if she had been briefed, not one of those blur ones. you got smoked lor. this kind of tactic i also used before when i was a cashier... some more they have contactless payment reader, don't take samsung pay is a blatant smoke bomb. dont wanna go into the technicality of it, but basically its something to do with book keeping. if their finance kns then it will alway be kns..
as long as you make the payment and its successful, u don't have to care how the business is being run right? i mean, sometimes as cashier, due to certain constraints, we impose the inconvenience on the customer side, making them to take responsibility but to no choice. Earlier planned to use Samsung Pay for my Watsons purchase for the $5 voucher promotion. However, the cashier gave me a confused look when I told her my payment mode and started to ask her colleague. Her colleague was equally as confused. In the end, paid with the physical card instead to avoid the long queue behind. Lai... Which Watsons is it? We go show them the promotion sticker they have with Samsung Pay then we educate them too~! After reading some previous posts... Either I didn't see it or it wasn't mention. But what happens if I get an NFC SIM Card and already using Samsung Pay? Will I need to choose in the settings which is the default app (payment)? I'm also using the NFC SIM for MRT rides. Based on the default settings on my phone, it does not affect Samsung Pay. Go through the MRT gantry, tap your phone (which need not even be on). Go to a store, swipe up to see your cards and pay via Samsung Pay. Works like a charm, no toggling of settings or app needed. Anybody manage to get both samsung pay and Android pay working? I had samsung pay and it was working fine. Then android pay came along and I installed it. How do I activate android pay? Tried just waking up phone and tap the terminal but keep showing "terminated"
[QUOTE=Omnia1;102304950]Yes it's supposed to be supported at all PayWave terminals. so technically, either samsung pay or android pay can exist in a phone for default automaticity. if one wants android pay and samsung pay, then the automatic portion of the payment mode will not be suitable..
Thats why i have removed android pay totally..
For me I just set Android Pay as default then "use open app instead of the default" as Samsung Pay. This way can tap and pay without launching any app, and when want use MST can just swipe up. 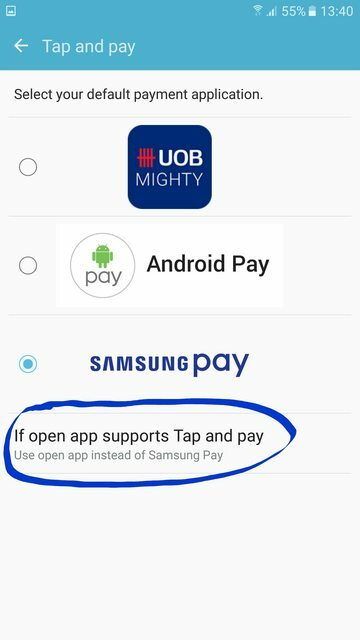 On first day i try setting Samsung Pay as default, and then "use open app instead of the default" as Android Pay. Android Pay didn't work even when I opened the app and then tap on the reader. Switch the default, and worked. yeah, android pay has no interface at app's level anyway, thats why it has to be the default and samsung pay be on app level. why would one wants android pay and samsung pay together huh? haha for promos is it? Android Pay with UOB cards is not that safe. UOB cards dun have the $100 limit. anyone tried it over seas with MST or NFC card reader?